With a simple rhyme scheme and adorable foil-embellished illustrations, Love counts a few of the ways and reasons parents love their children. A quiet, calming story, perfect for naptime or bedtime, it features a pair of adorable bunnies and all the things they do together - talking, cloud watching, and even snuggling up in their warm burrow away from a storm. To complement your sleepy story time, we're offering an ultrasoft, 10"-tall Rabbit Plush for your little one to cuddle at the end of a long day. 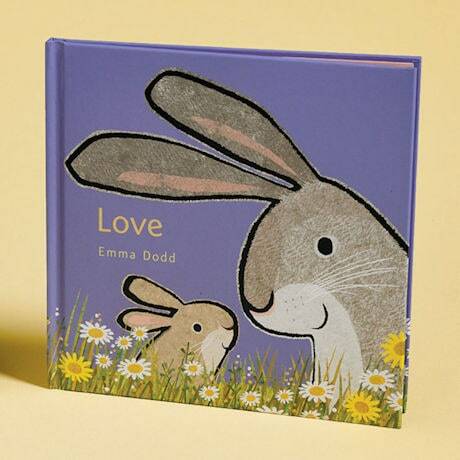 And after you read the story, you and your own little bunny can name all the reason you love each other - even though there are too many too count! For ages 1 and up. Also see Rabbit Plush.